New Pellet Wire Feature - What's Happening in Your Area? We welcome all references. Please see the full listing here, and direct any prospective applicants to send a cover letter and resume to [email protected] with "PFI ED Job" in the subject line. Pellet Fuels Institute responded to a recent story on biomass in the Boston Globe. The story on a Massachusetts proposal to allow biomass thermal to qualify for REC credits unfortunately did not include the views of any industry spokespeople. Although our letter has not yet run in the Boston Globe, we wanted to share with PFI members what we submitted. It is also posted to the news section of our website. I am a pellet fuels manufacturer writing in response to the August 7 article on biomass fuels. It's a shame the story didn't present the perspective of any pellet fuels producers, retailers or consumers. Our fuels, mostly made from sawdust that's left over from other businesses, are used to heat residences, schools and businesses across New England. Pellet stoves and boilers give their users more control over their heat source, and they save money and carbon compared to propane fuel and heating oil. Our customers take pride in using a fuel that is more environmentally friendly than any fossil fuel. And using locally produced fuels keeps dollars in New England's economy, supporting local businesses in rural areas. The virtues of "eating locally" are widely embraced. The Commonwealth should do the same with heating locally. Timber Products Inspection (TP) is the largest independent wood products inspection and testing agency in the U.S. Since 1969, TP has continued to strive to provide high quality inspection services to all of their clientele while maintaining the integrity and assurance long associated with their name. TP's determination has kept them on the leading edge of the industry, while their ambitious entrepreneurial spirit allows the flexibility to respond to the ever-changing needs of their clients. TP is one of the largest agencies in the American Lumber Standard Committee (ALSC) Softwood Lumber Program; the largest agency in the ALSC Treated Lumber Program; the largest agency in the ALSC Wood Packing Material Program; and the only ALSC approved grading agency that has representation in all regions of the US. In addition, TP serves as the largest agency accredited as an auditing agency and biomass testing laboratory for the Pellet Fuels Institute Standards Program. To date, TP has qualified 21 pellet producers under the PFI program, and works with 30 individual pellet manufacturing facilities. Today, we're announcing a brand new Pellet Wire feature. We want to see photos of what's happening with the pellet fuels industry in your neck of the woods. Send us photos with captions - facilities, retailers, production, appliances, happy customers! We'll run the photos in Pellet Wire. Thanks to Stan Elliot with Pacific Coast Pellets for the first submission! 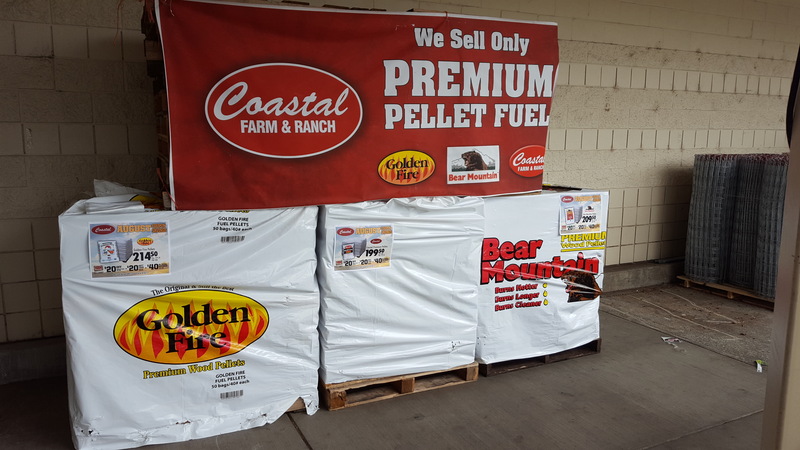 Coastal Farm Store (16 store chain in WA and OR) Auburn, WA |"Early Buy" sale on wood pellets set up in front of their store. China is a bit of a mystery to Canadian wood pellet producers. The Canadian wood pellet industry has traditionally relied on the European power market and more recently has penetrated Japan and South Korea. From time to time we have had casual inquiries from potential Chinese buyers, but nothing serious materialized. We believed that with its large population, its reliance on coal, and its insatiable energy demand, China would eventually see the benefits of using wood pellets to lower GHG emissions and reduce pollution. On June 7 to 8 I travelled to Beijing to attend a two-day biomass co-firing workshop and to promote Canadian wood pellets. The workshop was organised by the IEA Clean Coal Center in conjunction with the China Electric Power Planning & Engineering Institute (EPPEI). There were about 320 attendees, representing government, utilities (the Chinese being all state owned), universities, various think tanks, technology providers, consultants and biomass interests. How Can We Pass Up Option of Supporting Biomass Power? The Aug. 7 story on biomass ("Fuel plan draws critics," Page A1) demonstrated a profound misunderstanding of biomass power. New England biomass power facilities purchase leftovers and residues from local landowners, foresters, and mills, which they use as fuel to generate electricity. Far from "burning trees," the materials we use are the lowest-value fibers. They are produced by the forestry sector and, without biomass power, they would be left on the forest floor to decompose, emitting potent methane gas into the atmosphere. New England needs a baseload power source that runs constantly to supplement the growth of wind and solar in our market, especially as nuclear and coal facilities are being retired. What better resource is there than biomass, which supports rural economies and offers significant carbon savings over fossil fuels? A recent study found that the use of wood residues offers a reduction in carbon emissions of as much as 115 percent over natural gas, to produce the same amount of electricity. Existing biomass power plants are in danger of shutting down as they try to compete with cheaper, federally subsidized energy sources. Meanwhile, New England needs solutions to reverse rural economic decline and ways to sustain renewable energy growth. Can we afford not to support biomass power? Lori Simpson, chairwoman of the board of supervisors, said that she has been on the board for nine years and that entire time the board has been discussing biofuels. "Now, we have the whole package," she said. "A non-profit went out and acquired a grant to help pay for the system." "Yes there is a certain amount of risk," she added, "However, I ask myself, 'Am I going to be a visionary?'" Simpson declared, "I think this is a great opportunity. We are going to be the showcase for the state. I don't want to lose this opportunity."